Six candidates are campaigning to win the April 23 special election for an at-large D.C. Council seat. Their signs are popping up here and there. 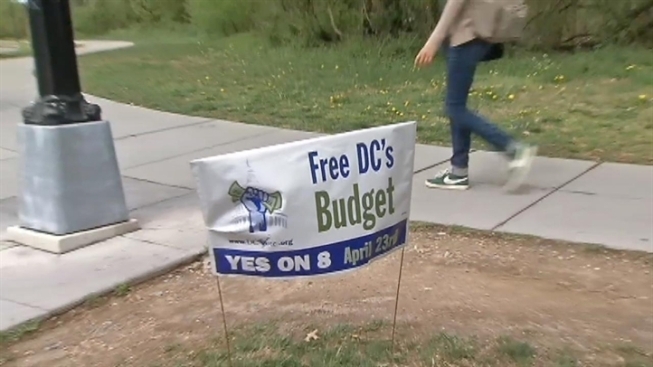 But thousands of blue and white "Free DC's Budget" signs are posted around town. On WAMU Radio Friday, Kimberly Perry, the new leader of D.C. Vote, explained their campaign, for which they’ve spent more than $10,000 on the signs. “We're the only city in the country that needs congressional approval of our budget before we spend our own tax dollars,” she said. The city charter amendment, if passed by voters April 23, would ask Congress for so-called budget autonomy -- the freedom to spend the $6 billion of local tax revenue without congressional approval. Congress hasn't indicated whether it would accept the change.